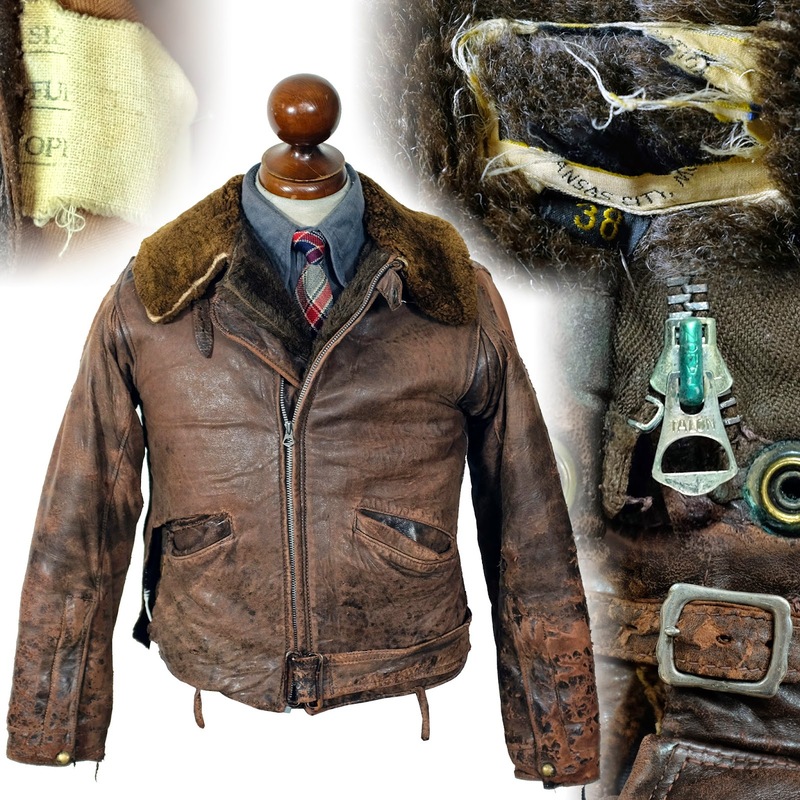 This vintage A-2 leather flight jacket was made in the 1940s, either at the end of the war or during occupation. A-2s ceased to be produced in 1943, but remained popular with servicemen, leading to a secondary market for non-contract private production. Theatre made examples like this are rare, but were commissioned by Americans who wanted a jacket that was no longer available through official channels. It is made loosely to the A-2 pattern, with a shirt style collar secured by snaps, flapped, snapped patch pockets, knit cuffs and collar, and a zipper front with a wind flap. The jacket has a one piece back and two piece sleeves. Unlike contract examples, this one has a Prym snap closure on the windflap, which takes the place of the hook and eye fastening usually found on the collar stand. The jacket has war-time German hardware, with a Zipp main zipper (with the back marked DRP, which stands for Deutschers ReichsPatent, and points to a 1945 or before dating of manufacture of the zipper). All the snaps are PRYM brand. The jacket is lined with a typically German plaid, which has been heavily worn and has been patched.